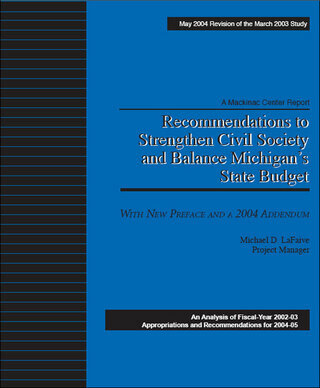 Bob Schneider and Barbara Graves, "Line Item and Boilerplate Summary, Career Development and Michigan Strategic Fund, Fiscal Year 2003," December 2002, p. 20. This estimate is based on information provided by Howard Heideman, Manager of Tax Policy, Office of Revenue and Tax Analysis, Michigan Department of Treasury, on Nov. 4, 2002. Michael LaFaive, "State Job Sites Duplicates Services," Michigan Privatization Report, Summer, 2001, p. 7, 12. Michigan Economic Development Corporation/Travel Michigan Advertising and Promotion document for the fiscal year 2002 obtained via the Freedom of Information Act. Lansing: October, 2002. Michael LaFaive, "A Tale of Two Sporting Goods Stores," Michigan Privatization Report, Summer 2002, p. 8-9. This section was adapted from Mackinac Center for Public Policy Viewpoint, "Government Economic Development Handouts Rob Peter to Pay Paul," Feb. 7, 2000, accessible on the Internet at http://www.mackinac.org/2670. Promissory Note dated Nov. 20, 2001 between GeneGo, Inc., a Delaware corporation, and the Michigan Economic Development Corporation, obtained through Freedom of Information Act, September, 2002.